Climate change is a scientific fact, but it has proven politically difficult to address. 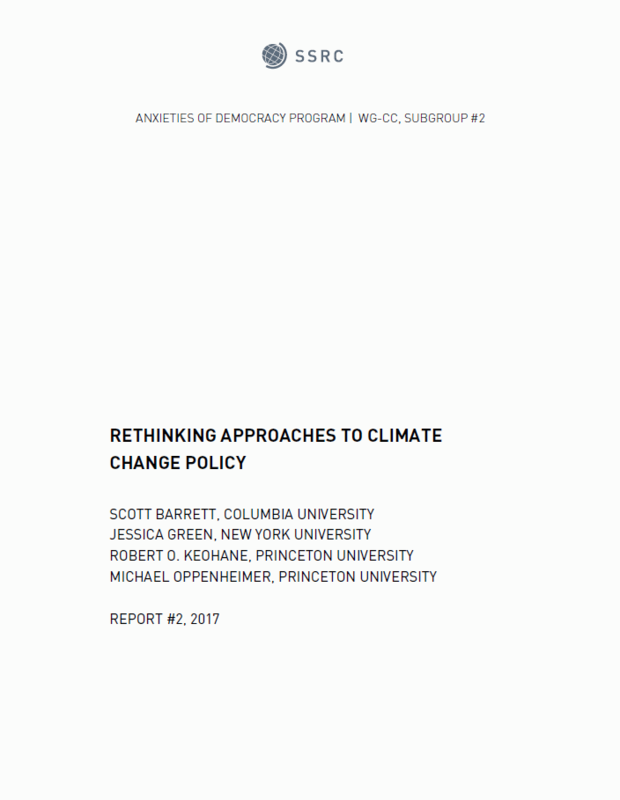 Three reports from the Anxieties of Democracy program’s working group on climate change seek to encourage new research in the social sciences in order to enable effective political responses to climate change. In this report, Scott Barrett, Jessica Green, Robert O. Keohane, and Michael Oppenheimer ask what broad strategies can be designed to increase the adoption of specific, successful climate policy initiatives. They propose seven criteria for evaluation, and, in light of these criteria, discuss five potential strategies ranging from "pledge and review" to direct enforcement. While they focus primarily on mitigation polcies (intended to reduce carbon emissions), they also advocate paying attention to other types of climate policy, such as adaptation and solar radiation management. Barrett, Scott, Green, Jessica, Keohane, Robert O. and Oppenheimer, Michael, Rethinking Approaches to Climate Change Policy (Social Science Research Council, November 2017).